CLUDING CARNIVAL, DISNEY CRUISE LINE, ROYAL CARIBBEAN INTERNATIONAL AND MSC. ECA requirements. 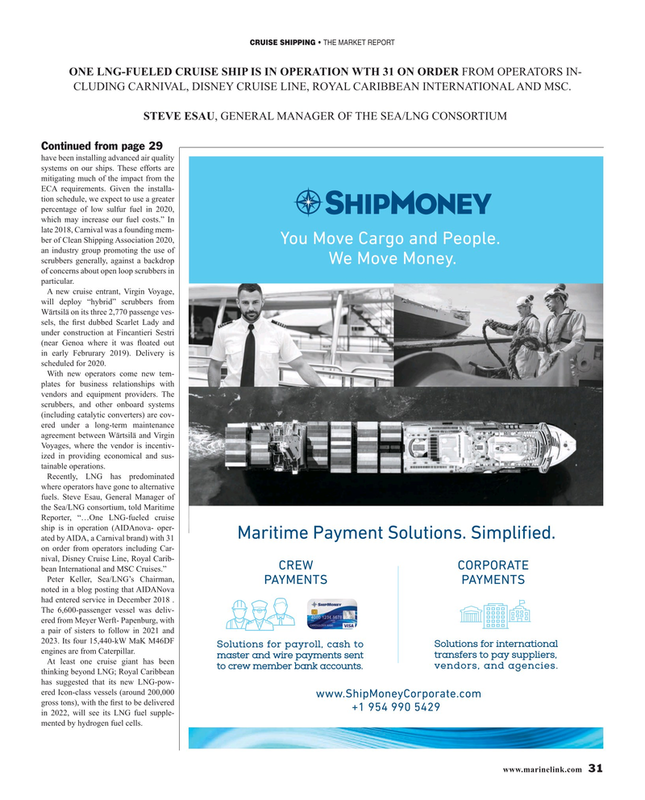 Given the installa- tion schedule, we expect to use a greater percentage of low sulfur fuel in 2020, which may increase our fuel costs.” In late 2018, Carnival was a founding mem- ber of Clean Shipping Association 2020, an industry group promoting the use of scrubbers generally, against a backdrop of concerns about open loop scrubbers in particular. Wärtsilä on its three 2,770 passenge ves- sels, the ? rst dubbed Scarlet Lady and under construction at Fincantieri Sestri (near Genoa where it was ? oated out in early Februrary 2019). Delivery is scheduled for 2020. Voyages, where the vendor is incentiv- ized in providing economical and sus- tainable operations. Peter Keller, Sea/LNG’s Chairman, noted in a blog posting that AIDANova had entered service in December 2018 . The 6,600-passenger vessel was deliv- ered from Meyer Werft- Papenburg, with a pair of sisters to follow in 2021 and 2023. Its four 15,440-kW MaK M46DF engines are from Caterpillar.